You’ve probably already heard that too much screen time is bad for you and that it is important to unplug from your digital devices. But you might be wondering how much is too much, and what is the harm, really? With many schools incorporating tablets into academic work, the time spent on screens of all types—smart phones, tablets, video games and TV—can add up quickly and stealthily. The Internet Trends 2014 report found that the average American (aged 16-44) spends 444 minutes or 7.4 hours staring at screens every day. That’s 147 minutes of television, 103 minutes on a computer, 151 minutes with smart phones, and 43 minutes on a tablet. The American Academy of Pediatrics has long recommended that screen time for kids and teens be limited to two hours a day, yet 2014 surveys by the U.S. Centers for Disease Control and Prevention that did not ask teens about the use of smart phones found that 75 percent of 12- to-15-year-olds spent at least two hours a day watching TV and using a computer; 15 percent watched TV four or more hours daily, and 12 percent used their computer for four or more hours. What is all that screen time adding up to? Plenty of concern for parents and pediatricians. If you need a reason to get serious about setting limits on your own screen time to improve your physical and mental well-being, here are five negative effects too much screen time could be having on you. Reduced fitness: More time sitting in front of a screen means less physical activity. Excessive screen time has been linked to obesity, elevated blood pressure and higher cholesterol. A 2010 study of teens in the American Journal of Epidemiology, found that teens who spent the most time in front of a screen had the greatest increase in body fat. 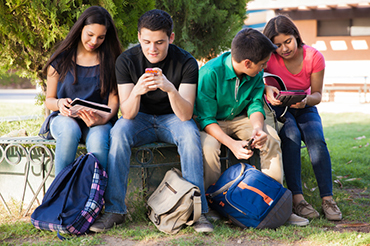 Sleep disturbance: The more time teens spend on screens of any type throughout the day, the less they sleep, found a study of 9,846 teens in Norway published in February in the journal BMJ Open. Those using electronics for more than 4 hours were 49 percent more likely to take longer than an hour to fall asleep compared with those who used their devices less, researchers said. Teens who spent more than 2 hours emailing or chatting online were more than three times as likely to get less than 5 hours’ sleep compared with those who had less screen time. Emotional costs: From videogame and internet addictions to a decreased ability to read emotions and reduced attachment to parents, and avoidance of face-to-face communications, the effects of too much screen time are varied and far-reaching. Teachers and principals have reported having difficulty getting students to engage in team assignments, finding that the teens would rather engage with a computer screen. Eye strain: “No one knows for sure at this point if prolonged use of digital devices actually causes permanent damage to the eyes, but it’s well established that it causes eye strain and discomfort,” says Gary Heiting, OD, senior editor of AllAboutVision.com. A 2015 report from The Vision Council found that 61 percent of Americans have experienced such eye strain. Now armed with some compelling reasons to ditch the digital overload and engage with the people and environment around you, talk to your parents and friends about ways to limit screen time. Plan accountability strategies that will work for you. Many tablets and smart phones have settings to limit use, and there are apps that can be installed to do the same. Check out this Washington Post blog about limiting screen time!